Although acne or pimples can develop anywhere on your body, but forehead is one of the most common areas where acne can breakout and pimples appear. Forehead is a part of “T-Zone” where the face produces most of its oil, along with the nose. The forehead is also that part of your body, which frequently comes in to contact with oils, conditioners, shampoos, dyes, hair split-end treatments, and hair mousse from your hair resulting into getting even more oil from such products than the scalp. This combination of all these factors makes the forehead more prone to occurrence of acne and pimples, particularly just above eyebrows and just below hairline. Pimples form when oil, dead skin cells and bacteria clog inside of the hair follicle. These can take the shape of whiteheads, blackheads, papule or pustule on forehead. In this article, you will find a complete guide about forehead acne causes and remedies and treatments for acne bumps and pimples on your forehead, without leaving acne scars. 1. Clogged Pores: This is the prime cause for acne trigger and pimple development anywhere. 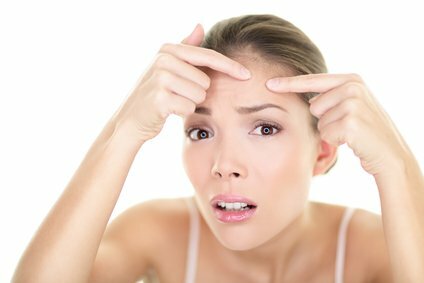 The forehead lies in the “T-zone”, the most oil producing area, resulting into the pores located on the forehead to get clogged more likely – leading to acne trigger. The remedy is to steam your face, including forehead, once or twice a month. But take care to not to overdo steaming, as excessive steaming is not advisable for acne prone skin. 2. Hair Dandruff: Hair Dandruff is also a prime cause for acne and pimples on forehead. The most effective remedy is getting rid of dandruff by using a good quality anti-dandruff shampoo, and wow your forehead acne will disappear fast. 3. Oily Scalp: An oily scalp tends to dribble oil on the forehead that can cause clogged pores and thus pimples can occur on your forehead. If this is the reason for your forehead pimples, the best natural remedy is to wash your hair more often to keep your scalp oil-free. 4. Certain Medications: Some medications, such as birth control pills, have a tendency to cause pimples or acne on the forehead in case of certain people. The remedy in such cases is to consult your doctor and check the medicine’s side effects concerning hormonal issues. 5. Unbalanced Diet And Digestive Issues: In case you don’t have the above issues, poor digestion can be another probable cause. If such is the case, you need to have a balanced diet. Drink lots of water and include more of green leafy vegetables and fruits in your diet. Avoid those foods that upset your tummy, such as fried foods. 6. Certain Hair Products: Certain hair styling products, such as hair spray, serum or heat protectant can be the culprits when they come into contact with your forehead to trigger acne and pimples. If such is the case with you then switch over to organic hair products. 7. High Level of Stress: This is another cause for development of acne or pimples. The simple remedy is to live a healthy life style. You can try meditation or yoga to reduce stress. Exercising, listening to music and pursuing your hobby are the other options to reduce stress. 8. Over Exfoliation: Too much of a good thing can be bad!! Although exfoliation aids in getting rid of dead skin cells and rejuvenates your skin, too much of it can lead to skin irritation and triggering of acne. Doing exfoliation is a good skin care routine, but do not do it more than twice a week. 9. Helmets and Caps: This can be a reason for those who drive two wheelers and wear helmets. As mostly people don’t clean their helmets regularly like the makeup brushes, the inside of helmets becomes sticking ground for dust, germs and bacteria. This then becomes a reason for acne to break out on your forehead. The remedies are that one you keep clean inside of your helmet free from dust and two cover your head with a clean cotton cloth while wearing helmet. 10. Hormonal Issues and Genetic Reasons: The hormonal and genetic factors can also cause forehead pimples and acne. Genetic factors are most difficult to treat. The hormonal problems can be resolved with the help of your doctor. 1. In the first place try to minimize the above potential triggers for acne breakouts on your forehead by making changes in your lifestyle and habits. More specifically you can follow following practices to avoid forehead bumps and pimples. 2. Washing your hair every day with shampoo is essential for forehead acne treatment. Although shampooing every day might dry out your hair, but it’s likely that an oily scalp is causing your forehead acne bumps and pimples. 3. Don’t allow your hair to rest on your forehead, as that may worsen the pimples on your forehead. Pull back and tie your hair into a ponytail. Shun using greasy hair gels and mousse. 4. One of the best ways is to prevent forehead acne bumps is to keep your forehead clean of any bacteria, dead skin cells and dermis by washing your face two times a day with an antibacterial, gentle face wash. Be aware not to clean your forehead too extensively and make it sure to use washed bath towels, but not the someone else’s towel. Do not scrub, but just pat dry your forehead. 5. Use Mild Hair Products: If you have substantial forehead acne bumps; avoid using oily hair products – use gentle hair products devoid of excessive fragrances and chemicals, as they can drip down onto your forehead to clog the pores causing skin irritation and acne breakouts on your forehead. If you have oily hair, wash your hair more often to prevent seeping of oil from hair onto your forehead. Also keep long hair away from your face and forehead. 6. Minimize Use Of Cosmetics: Consider avoiding use of too much make-up, toning masks, powder, blushes and oil based make-up. They tend to clog your pores. It is recommended to have some make-up free days, leaving your facial skin in its natural state. If at all you need to use make up, apply oil-free or water-based make up. Lastly, make it sure to cleanse your make-up every night before you sleep. 7. Use Your Own Clean Pillowcase and Bed-Sheets: This is a must, in case you have very oily and greasy skin. By using un-cleaned pillow cover, you let your forehead to be engrossed in oil from your own face and hair and also germs and dirt every time you go to sleep. Make it sure to wash your pillowcase at least two times in a week. 1. Clay Mask With Tea Tree Oil: Prepare a thin clay mask with water. Add few drops of tea tree oil, and apply the mask on your forehead. Leave the mask overnight, and rinse it off in the morning. Cover your pillow with a clean towel to avoid mess. This natural mask will cure the acne bumps and pimples on your forehead. 2. Lemon Juice: Dab a few drops of lemon juice over the zits on your overhead, leaving it overnight. The best time for this home remedy to use is at night. Make it sure to not step out in the sun, if you apply it during the day. Lemon juice makes your skin photosensitive that can be damaged by the sun light / rays and cause skin blemishes. If you apply this remedy regularly, it will reduce the appearance of acne and pimples on your forehead. 3. Apple Cider Vinegar: This is another good natural remedy for forehead pimples. Simply dab a little bit of apple cider vinegar once or twice a day over your forehead zits. 4. Mustard Powder And Honey: Mustard contains natural salicylic acid. Most of over-the-counter acne medications contain salicylic acid as an active ingredient. Mix a little bit of mustard powder with honey to apply over the forehead zits, leaving it on the zits for 15-20 minutes. Rinse it off. Mustard is also packed with vitamin C, zinc, and omega 3 and 6 fatty acids, which all are good for your skin – making it healthy and glowing. 5. Tea Tree Oil: Tea tree oil is well known to very helpful in curing forehead acne and acne in general. Take a cotton pad and soak it in water, and then wring it well. Just put 2 drops of tea tree oil over it and apply it on your forehead acne and pimples. Tea tree oil contains antibiotic properties that can exterminate acne causing germs and bacteria. 6. Orange Peel: Take orange peel and grind it with some water to make its paste. Dab it over your forehead for getting rid of pimples and acne. Let the mixture sits on your forehead for about 5-10 minutes, and then rinse it off with water. 7. Tomato Mask: Do you know that tomato is not only good for your health, but its mask can be used for treating acne as well as the acne scars. Just cut a tomato and scrub it on your forehead two times a day. Tomato is packed with antioxidants, thus its juice is very effective in healing acne and acne scars. Caution: Excessive use of tomato juice can lead to dryness, so dilute the juice with water if you want to use more than two times a day. 1. Avoid pricking or popping pimples, as this can lead to permanent scarring. 2. Try to use oil-free or water based beauty products, including moisturizers and sunscreen. 3. If you don’t observe any reduction in your forehead acne in about 4 to 6 weeks, consult a dermatologist. 4. Make it sure not to touch your forehead with your unwashed hands. Keep yourself hydrated to prevent aggravation of forehead pimples and acne bumps. 5. Your forehead acne will be cured fast if you keep your body well-hydrated. Drink 8-10 glasses of water in a day to keep your skin well hydrated to help prevent occurrence of acne. Choose and try some the above natural remedies for getting rid of forehead acne bumps and pimples. However in severe forehead acne cases, it’s best to consult a dermatologist. I dont know why,but nothing’s happening with my pimples even if i tried all the possible remedies. Is this part of my puberty/adolescence or there’s a problem with me? I personally love tee tree oil. u just have to use it overnight for a couple months and I know this can be frustrating but it works miracles trust me. once it starts kicking in, the zits stay away. If nothing is working out, I suggest you consult a dermatologist / skin specialist to find out the root cause and get it treated……. Hi, I have almost tried all of these remedies but it doesnt seem to work. I never broke out on my forehead, ever since i started doing my eyebrows and that too from the 3rd or the 4th time my skin developed rashes and they became pimples. My eyebrow pimples are almost sorted but these forehead pimples are so stubborn. They dont seem to go! I am so fed up , they look terrible! Also, these small spots are around my chin. Does this indicate something? Please note i never broke around my forehead or chin. Oh my gosh that’s the same with me they just won’t go on my forehead and now and again I get spots on my chin it’s so annoying ? I suggest you consult a dermatologist to find out the root cause for your problems and treatment………. I have tried every single one of these and they get rid of the redness of my acne and they do fade away for a while but all of a sudden all my acne surface again and they stay. I’m only 14 so could it be because of puberty? My mom tells me it is but i have a lot of acne compared to all my friends who complain about 1 small pimple. My acne surfaces and when they fade, a scar is left behind and it makes me feel insecure. Help? get plenty of sleep n relax.. pimples will disappear… GOOD LUCK! I started getting acne around when I was 10 , it’s wasn’t much just small bumps on my forehead and then it started to become more around the age of 12 , so eventually I felt insecure and tried to hide it with makeup which absolutely worsened the conditions. Now I’m 14 and I have lots of pimples only on my forehead ,between my eyebrows and a bit on chin . I’m trying different remedies like tea tree oil but nothing seems to be really helpful. And the scars which are left behind are almost impossible to remove . Any advice? Your problem seems to be very severe. I suggest you consult a good dermatologist………..
Do any of these remedies actually work? Yes, they do work in case of mild acne problems. Also if you take care with natural remedies they reduce the chances of acne / pimples development or help in reducing their intensity. However, there are cases of stubborn acne where you need treatment by a dermatologist. Unless you remove the root cause they are unlikely to be cured. Does toothpaste work if put it on and leave it over night? And when you put lemon do you need to put lemon juice or just rub the lemon on your face? Do u use any of these tr treatments if so which ones? I don’t have acne problem any more. I had it when I was a teenager and I used home remedies only……..
yeah I know but I’m asking which one would help ? like what did you use if you mind me asking ..
honestly which one you perfer I should use for the pimples on my forehead ? I started getting acne when I was like eleven years old, it first started as a single pimple every one or two months, then it gradually increased especially on my forhead. Sometimes I get small pimples everywhere on my forhead, but now I get bigger whiteheads. They are very painful when I look down, or touch it. I could literally feel the weight, Now it’s on my forhead, between my eyebrows, the two edges of the nose, above my chin, below my eyes and at the top of ears. They painful as hell. And sometimes feel itchy. Now I’m thirteen and I don’t think it is because of puberty. I even consulted a lot of doctors and each of them said different reasons. I tried applying cleanser and moisturizer for four months and they still remain the same. They just appear and dissappear. I’m not a very healthy person as I’m skinny and short in my school. Could it be because of my diet? But I don’t eat unhealthy food. Please help I’m so confused. also you could try melrose essential oil. I recommend young living melrose. It always gets rid f all of my acne within one night-it might take a week or so to completely disappear if your acne is as bad as it sounds. Thanks for sharing your tip.. It depends ob the kind of acne you are having. You can try Benzoyl peroxide formulated product. My daughter is going through her preteen years and began getting acne on her forehead. I didn’t want anything to harsh for her skin, so I looked on the google and found dermalmd acne serum was reviewed better than others so I decided to try it on her. Her skin began to clear up right away. She saw the difference and now has her own ritual of cleaning her face and using dermalmd acne serum before going to bed. Very nice trick related to forehead acne, some of them work great at me, thank you for share. I have some acne starting to form on my forehead. But I also have some blackheads. I’ve noticed that my blackheads later on turn into pimples. I’m not sure which remedy would be the best for me. Any advice on how I can get rid of this fast? I am in my early twenties and have always had a problem with acne since a year after I started puberty. I have oily, acne prone skin with redness all over. I have tried many other methods to try to reduce my breakouts like clearing my pores, washing my face twice a day, using skin products to control my sebum and using tea tree oil directly on the breakout. Using tee tree oil did help for the first few month but then I noticed it didn’t have the same effect as it did in the beginning. I’ve heard many good reviews about this dermalmd blemish serum and decided to give it a try. Since I don’t have a specific spot where I break out and acne just tends to appear randomly on my face I would use this as a serum and message it into my skin. Overnight I could see swelling had gone down or the smaller pimples would only be a red spot. I don’t see any changes in my acne scars or dark spots but that didn’t bother me. I’m hoping this will continue to give me good results. It does have a slight medicated smell to it for those who are sensitive to scents. We like to honor numerous other web web pages around the internet, even though they arent linked to us, by linking to them. Underneath are some webpages really worth checking out.